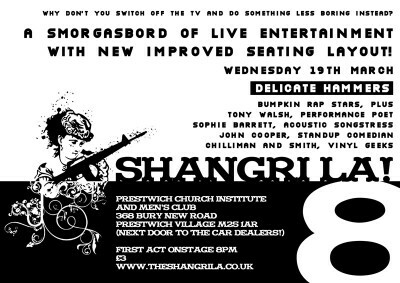 Top marks to the ShangriLa people for bringing a bit of kulture to Prestwich. Checkout Delicate Hammers on myspace. Think they're Manc based but the singer sounds Welsh? The track I heard was like Vic and Bob over early Talking Heads with something about Greggs pasties!